While the root of an iris looks like a bulb and is commonly referred to as a bulb, it is actually a rhizome. They are similar to bulbs and need similar care. Generally, you do not need to do anything special to care for iris rhizomes during the winter, except covering them with mulch; however, if you live in area with harsh winters, you need to take special care if you want them to survive. Dig up your iris rhizomes before the first frost. Be sure to not damage them in the process. Generally, the rhizomes are just below the surface of the soil. Expect the roots to pan out along the sides since rhizome roots grow horizontally, not vertically. Select the rhizomes that are the healthiest. They should be firm, not soft and mushy. If they look rotted, they probably should be thrown out. Cut the “fans,” which are the shoots and roots sticking out of the rhizomes, to about three-to-four inches from the rhizomes. Sprinkle them with some sulfur to prevent them from rotting and to prevent insect damage. Sulfur is available at your local home and garden store. Store in a dark, cool location. A garage, crawl space or basement are examples of ideal locations. You can store them in an open container with peat moss and add a small bit of water to keep them moist and firm. Check on your rhizomes occasionally to be sure they are not rotting or shriveling up. If so, add a small amount of water to the peat moss. 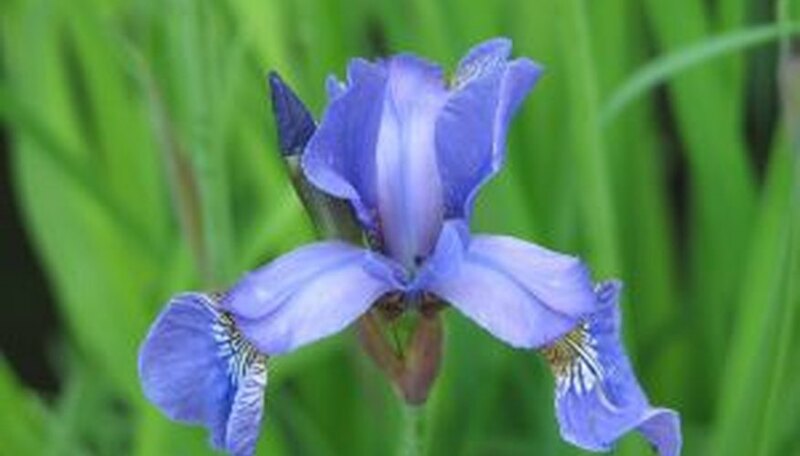 Plant the irises as soon as you are able to dig into your ground. If it is still cold outside, put two to three inches of mulch over the top of where you plant them.